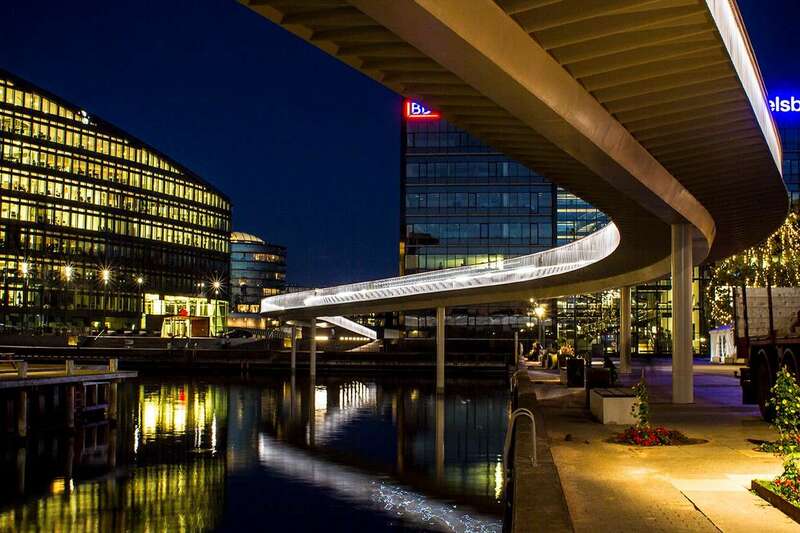 Copenhagen’s iconic cycle bridge, Cykelslangen (The Bicycle Snake) connects the city and transports cyclists across the harbour on an aesthetic ride above the harbour basin. Cykelslangen is yet a perfect example of what puts Copenhagen among the very best bike cities in the world. Its slender design and the experience it offers to cyclists stands out as a perfect contrast to the buildings and concrete between which it passes. In the hand list there is a luminaire with led lights, which in the evening illuminates the lane evenly without aperture. The bridge deck has a slight drop towards the center where rainwater is led down to drain located inside the pills. Jump on a bike – it’s quite a lot of fun to ride at night.